CMBS 在车辆每次启动时不会默认开启。驾驶员可以通过仪表板上的按钮开启和关闭 CMBS。只要按钮处于“开”位置，CMBS 就会始终处于活动状态。 CMBS relies on radar detection of the obstacles in front and is constrained by anything which limits its ability to detect, such as dirt, mud or snow covering the radar sensor. In such circumstances, the on-board monitoring system would notify the driver of impaired radar detectability. 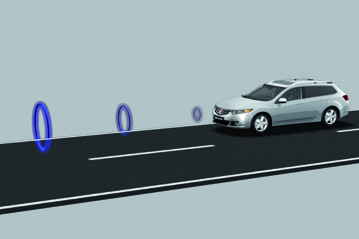 CMBS was one of the first autonomous emergency braking systems to be developed and uses a single radar sensor which, in normal circumstances, will detect all vehicles from a small motorcycle upwards. Bicycles are usually not detected. Conversely, the system may sometimes detect metallic objects which pose no threat. More recently, multiple sensor systems are being applied by industry to overcome such issues. However, Honda has carefully balanced the sensitivity of CMBS to maximise its effectiveness when needed and to minimise irritation to the driver when it is not needed.